This is without doubt one of the most beautiful and unspoilt trekking areas in the entire Himalayas.The trip begins in Paro, gateway to Bhutan and set in a wide valley dotted with traditional dwellings and terraced farms, watched over by the great Paro Dzong (monastery Fort). From here you head up valley where the trek begins. You will follow the waters of the Paro chu river up through forests of pine and juniper and into high alpine meadows for stunning views of Mt. Chomolhari (7316m) and Jichu Drake (6797m). This is wild country and its quite possible that you will see the rare blue sheep or bharal. From here the trek heads north-east to the village of Lingshi (3800m). The Lingshi Dzong is over 600 years old. It was built by a Lama for purely monastic purposes but due to its strategic position it soon became one of the strong holds against invading Tibetan armies. From Lingshi you then head down along ancient trails and through un-touched forests to reach Thimphu, Bhutan’s tiny capital and the concluding point for the trek. There will be time here to see the sights, notably to massive and imposing Tashichho Dzong. Bhutan’s seat of power. Then you will return to Paro where the trip concludes. Day 10. Lingshi – Shodu: 8 hrs walk. Day02: Free day in Kathmandu or sight seeing around kathmandu valley with English speaking guide. the town of Boudha , on the eastern outskirts of Kathmandu . various interesting legends are told regarding the reasons for its construction. After the arrival of thousands of Tibetans following the 1959 Chinese invasion, the temple has become one of the most important centers of Tibetan Buddhism. Today it remains an important place of pilgrimage and meditation for Tibetan Buddhists and local Nepalis, as well as a popular tourist site. 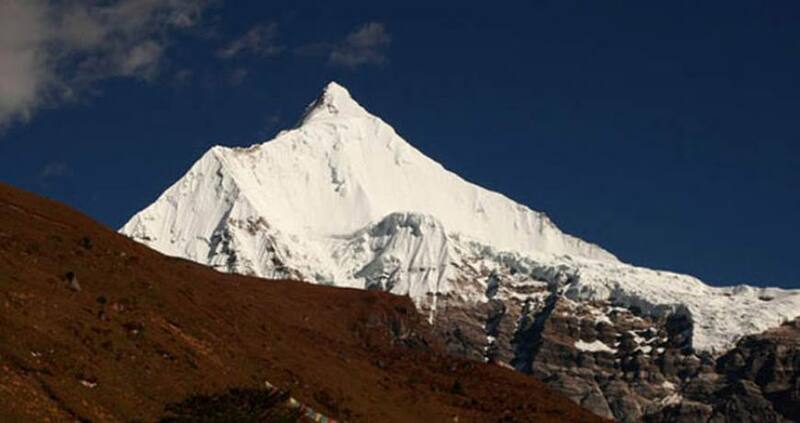 It is a classic 9-day Trek starting from (Drugyal Dzong) Paro and end at Dodena near Thimphu. The route passes through two high passes from Jangothang. The view of Jumolhari Mountain (7314 M) from Jangothang is spectacular. The Trek is strenuous and is very popular. The highest point is 4115 M.
Day 03. Arrival at Paro: Upon arrival at Paro airport, received by representative from our company, transfer to the hotel. Dinner and overnight at the hotel in Paro. Day 04. Paro sightseeing: After breakfast, drive to the ruins of Drukgyel dzong, now in ruins was built by Shabdrung Ngawang Namgyal to commemorate the victory over the Tibetan invaders in1644; the dzong name’s means indeed “ victorious Druk “. The Dzong was used as an administrative center until 1951 when a fire caused by butter lamp destroyed it. Then visit Kyichu Lhakhang, one of Bhutan’s oldest and most sacred monasteries dating from the introduction of Buddhism in the 8th century and then visit Rimpung Dzong (Paro Dzong) built in 1646 by Shabdrung Ngawang Namgyal. The Dzong presently houses administrative offices. After lunch visit the Ta dzong, an ancient watchtower, which has been, since 1967, the national museum of Bhutan. Dinner and overnight at the hotel in Paro. Day 05. Paro – Shana (Start of Trek): Our trek to Shana starts at Drukgyal Dzong following the Paro river and we pass cultivated fields and tiny picturesque villages. The forests are alive with numerous birds and brightly coloured butterflies. Overnight at camp Shana. Altitude 2,820 m; Distance 14 Km; Time 5 - 6 hours. Day 06. Shana – Thangthangka: The trail follows the river through a heavily forested area with a few isolated farmhouses. It narrows and closes in and the trail winds up and down along the drainage. We pass a junction enroute, where another path leads north over the Tremo La to Tibet. Camp is in a meadow with a stone shelter. Altitude 3610 m; Distance 21 Km; Time 7 - 8 hours. Day 07. Thangthangka – Jangothang: In the morning after passing a small army post, the trail slowly leaves the forest line and gradually climbs into a beautiful valley, passing Tegethang, a winter home of yak herdsmen. Lunch will be served in one of these huts. Lots of yaks will be seen today before we arrive at the Jhomolhari base camp (4,115 m). High mountains overlook the camp and visible nearby are the ruins of an old fortress used to guard Bhutan against Tibetan invasions. Altitude 4,115 m; Distance 15 Km; Time 5 - 6 hours. Day 08. Jangothang: Rest day at Jangothang, enjoy the superb view all around. Day 09. Jangothang – Lingshi: The trail follows the stream for half an hour and crosses the bridge to the right side. Start the climb up to the first ridge with a breathtaking view of Jumolhari, JichuDrakey and Tsrim Ghang. Then walk towards the valley, almost flat for a while, until the climb to the Nyeley la pass at an altitude of 4,700 meters. After the pass it’s a gradual descent to the Lingshi camp, enjoying the panorama view of the peaks and Lingshi dzong. Camp altitude is 4000 meters. Walking time 7-8 hours. Day 10. Lingshi – Shodu: 8 hrs walk. The trail today climbs to Yalila Pass (4820 m), from where on a clear day, impressive views of Mount Jumolhari, Tserim Kang and Masagang can be seen. Day 11. Shodu – Barshong: This is the place where one comes back to the tree line. The path follows the Thimphu River, descending through rhododendron, juniper and other alpine forest. The view of the cliff facing rocks and waterfalls are stunning. Hot lunch will be served by the riverside. After lunch the trail gradually ascends to the ruins of the Barshong dzong, reaching the camp at the altitude 3600meters. Walking time 6-7 hours. Day 12. Barshong – Dolamkencho: The road descends through alpine forest and we once again join Thimphu river for a while. After lunch climb up to Dolamkencho camp at the altitude of 3600meters. Walking time 5-6 hours. Day 13. Dolamkencho – Dodena – Thimphu: The path descends through bamboo forests finally joining Thimphu River again. 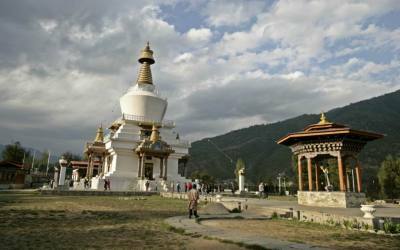 Arrive at Dodena where you will be picked up for the drive to Thimphu (15 km) 4 hours walk. Overnight at the hotel. Day 14. Thimphu sightseeing: The day begins with a visit to the National Memorial Chorten (1974) built in honour of our late King Jigme Dorji Wangchuk and the Dupthop Lhakhang one of the few surviving nunneries in Bhutan. We then visit the National Library, stocked with ancient Buddhist manuscripts, and the Painting School where traditional art is still kept alive through instructions in the art of painting Thangkas (sacred Buddhist religious scrolls). After lunch we drive to the Traditional Medicine Institute where medicines are prepared according to ancient practices, and to Lungtenzampa to observe the Royal silver smiths and Bhutanese paper factory at work. Other highlights include a visit to the Tashichho Dzong, seat of the national government and the Central Monastic Body, including the summer residence of the Je Khenpo (Chief Abbot of Bhutan). The Tashichho Dzong is open to visitors only in winter when the Je Khenpo and the Monk Body move to Punakha the ancient winter capital of Bhutan. We drive to Simtokha Dzong; the oldest Dzong of Bhutan built by Shabdrung in 1627 and finally visit the Handicrafts Emporium followed by shopping for souvenirs in the shops of Thimphu. Over night in Hotel. Day 15. Thimphu- Punakha - Thimphu: (72 Kms, 2 hours drive). After breakfast, Drive to Punakha via Dochula pass. If the weather is clear, we stop for a while at Dochula pass to view Higher Himalayas. Lunch at Punakha. 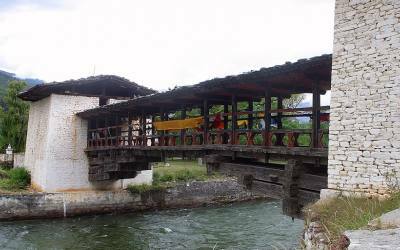 After lunch, visit Punakha Dzong built in 1637 by Shabdrung Ngawang Namgyal and is situated between Pho Chu (Male river) and Mo Chu (Female river). For many years until the time of the second king, it served as the seat of the Government. The construction of the Dzong was foretold by Guru Rimpoche, who predicted, “…a person named Namgyal will arrive at a hill that looks like an elephant”. There was a smaller building here called Dzong Chu (Small Dzong) that housed a statue of Buddha. It is said that Shabdrung ordered the architect, Zowe Palep, to sleep in front of the statue, while Palep was sleeping, the Shabdrung took him in his dreams to Zangtopelri and showed him the palace of Guru Rimpoche. From his vision, the architect conceived the design for the new Dzong, which in keeping with the tradition, was never committed to paper. The Dzong was named Druk Pungthang Dechen Phodrang (Palace of Great Happiness). The war materials captured during the battle with Tibetans are preserved here. Punakha is still the winter residence of Je-Khenpo and King Jigme Dorji Wangchuk convened the new national Assembly here in 1952. In the evening, drive back to Thimphu. Overnight in Hotel. Day16 : Drive to Paro airport for the connecting flight to Kathmandu. During the afternoon sight seeing around Patan. monuments. The diversity of the medieval culture that allowed both Hinduism and Buddhism to flourish has left a rich legacy of impressive sightseeing in this city for today’s visitors. attraction. The square is full of ancient palaces, Temple and shrines, noted for their exquisite carvings. The Patan durbar Square consist of three main chowks or countryards, the Central Mul Chowk, Sundari Chowk and Keshar narayan Chowk, The Sundari Chowk holds in its center a masterpiece of stone architecture. The Royal Bath called Tushahity. It was listed in the UNESCO world HeritageMonument list in 1979.